As anyone who sat through the last three “Pirates” movies might expect, “The Lone Ranger” is too complex for its own good, culminating in a long-winded third act that feels like it’ll never end. The script tries to cram so many different characters and subplots into the story that it sacrifices character development as a result. There are a lot of good actors that pop up in small roles (including Helena Bonham Carter as a tough prostitute with a wooden leg that packs a punch and Barry Pepper as a crooked Army captain), but many of them don’t seem to serve much purpose other than to overcomplicate things. The rest of the cast doesn’t fare much better, although Fichtner is fairly entertaining as the cleft-lipped villain and Hammer holds his own as the titular hero. 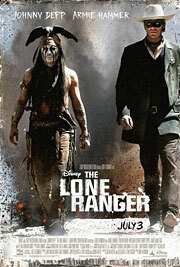 But of course, it’s Depp who steals the show once again, proving that he’s at his best playing eccentric characters like Tonto, and it doesn’t take a genius to realize that the oddball Comanche is the juicier of the two lead roles. Credit to Verbinski, then, for giving both actors an equal share of screen time. Though Tonto is far more interesting, the characters work best during their scenes together, thanks to some fantastic chemistry between Depp and Hammer. Unfortunately, their playful camaraderie isn’t exploited nearly as much as it could be, because while the movie is incredibly lively in its opening and closing minutes (including one of the most ridiculous action sequences ever filmed), that sense of high-energy fun is absent for most of the middle section, when it starts to take itself too seriously. Part of the problem is the runtime, which clocks in at 149 minutes but feels about an hour longer. That could have been easily remedied if Verbinski had just removed the pointless framing device that features an elderly Tonto recounting the story to a young boy at the San Francisco fair. Without it, the movie still would have made sense (as much as it already does, anyway), and it wouldn’t drag quite as much. It’s the stop-and-go nature of the storytelling that really hurts the end product, especially when the film already feels so bloated, packed with too much… well, everything. 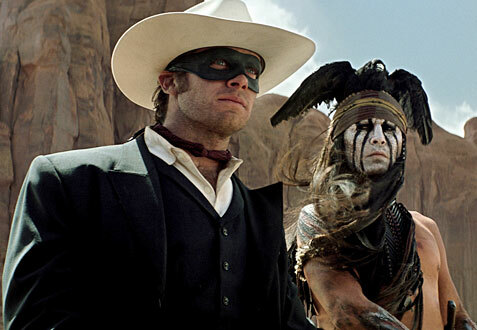 “The Lone Ranger” still has some pretty great moments, primarily due to Depp’s comical performance, but they’re not enough to save the movie from mediocrity, and unlike the first “Pirates of the Caribbean,” it doesn’t leave you wanting more.